Our forefathers recognized the great importance of a good education; thus, each community established a school to reach the children in its particular area. In time, educators in Monroe County, Ohio served in more than one hundred one-room rural schools. 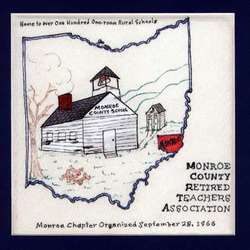 Proud of this rich past history, dedicated Monroe County retired teachers organized an association (MCRTA) in 1966 to preserve their past heritage and to provide a positive influence on schools and teachers of the future. Mr. I. M. Straight, retired school principal, chaired the first meeting. The chapter's purpose was "to make retirement time alert, active and available." The MCRTA affirms positive contributions. Retired teachers composed the 1976 booklet entitled The One Room Schools of Monroe County. MCRTA honored senior citizens ninety years old or older and presented to the Monroe County Historical Society an antique teacher's desk. In 1985 School Superintendent Delven Devore was elected District Director of the East District of the Ohio Retired Teachers Association. In 1986 the chapter voted to oppose the ruling that ORTA's fund be placed under federal jurisdiction. Currently the MCRTA schedules annual events and places a book in the Monroe County Library in memory of deceased members.